Another Satisfied Princess Hat Customer! Our cute model is displaying her new Princess Hat. These one-size-fits-all hats are made of felt and interfaced to keep their shape. Actual colors and decorations will vary, these are hand made, one at a time, and no two are alike. All of them have silky ribbons to tie under the chin for windy days. The hennin was a headdress in the shape of a cone or 'steeple', worn in the late Middle Ages by European women of the nobility. They appeared from about 1430 onwards. They were most common in Burgundy and France, but also elsewhere, especially at the English courts. Fanciful and fun! 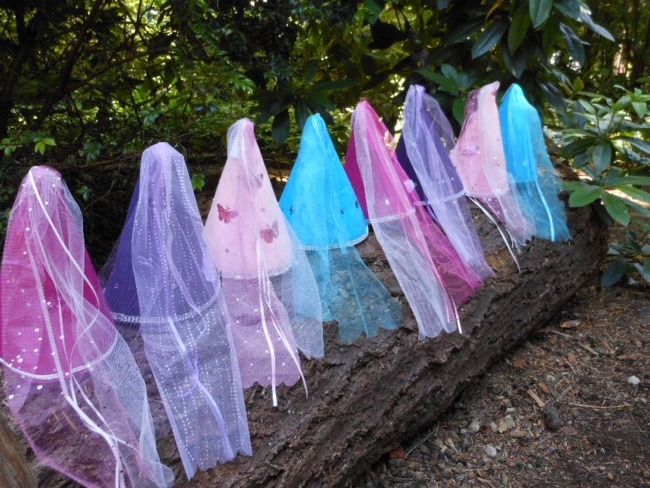 Handcrafted handmade Princess Hats for damsels of all ages! Made of felt and adorned with fanciful jewels, tulle and ribbons. Each hat is 10.5' tall and measures 23' around at the base. Fits toddler to adult. All have silk ribbons attached so they can be tied on securely under your chin. Made of soft felt, can be packed and stored - and instantly pops back into shape! Get ready for outdoor adventure with a handmade one-of-a-kind Robin Hood (or Peter Pan) hat! Made of felt and interfaced to keep it's shape. Each hat has REAL feathers.